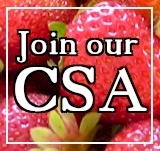 Every Tuesday, Friday, & Saturday during July & August, we invite our CSA members and their children to participate in the life of the farm by attending Farm School – we plant seeds, harvest veggies, collect eggs, visit the farm animals, and much more. It’s a wonderful opportunity for your children to learn, first-hand, about where their food comes from and about the stewardship of land. We love seeing the way kids pour themselves wholeheartedly into the activities of farming! Farm School is absolutely free, and no registration is required. It lasts for about half an hour. Just meet Farmer David on the barn porch, and you’ll head out! Come join us for Farm School in July & August!